We have great pleasure in placing before our readers, Swami Virupakshananda's lucid English translation of Tarka-samgraha and of Dipika the brilliant commentary on it by Annambhatta. Tarka, as the Indian system of logic is called, is not an intellectual pastime for the pedant but a fine and precise tool for the philosopher who probes to discover the ultimate truth. While the Tarka-samgraha is meant primarily to unlock the doors of the twin-darsanas of Nyaya-Vaisheshika, it is also the master key that has been used by the Acharyas of the other darsanas- the Sakhya and Yoga, MImamsa and Vedanta. All Indian philosophy is characterized by the application of a rigorous logic that often looks hair-splitting to the untrained layman; but it is the very subtlety and vigour of the logic that has enabled the different metaphysical systems to stand the test of time and the tide of fashion. When the common reader peruses a commentary of Sri Sankara, for instance, he often wonder why the great Acharya wastes his time and our patience by quibbling at length on points that convey no significance to us. But when we become familiar with the rules of Tarka, we shall be able to appreciate the integrity that compels the master-mind to analyse so thoroughly the logical implications of a statement or term. Sri Sankara often deals with verities that defy verbalization. But when words have to be used to communicate a truth, he is particular that there is no vagueness or looseness in the terms employed or arguments pressed into service. He points out that right Tarka is necessary into service. He points out that right Tarka is necessary to apprehend the Highest and warns us against the temptations of false Tarka-tarkyatam ma kutarkyatam. It is hoped that this lucid translation of Tarka-samgraha and the Dipika by Swami Viruakshananda will enable the reader to enjoy out traditional philosophical texts better. As I was studying the Tarka-samgraha with the Dipika under the able guidance of Sri V.R. Kalyana Sundara Sastri of Madras, Sahityavisarada, Sahityasiromani, Vedantasiromani, Bhasyabhavajna, it occurred to me that a lucid and simple translation of the text and the Dipika in English would be of immense help to the student of the Text. Accordingly, the English translation of the work first appeared serially in the Vedanta Kesari, a cultural and philosophical monthly organ of the Ramakrishna Math, a few years back. With all humility I must submit that but for the encouragement and help from the learned Sastri, it would never have appeared in its present form. I am also much indebted to Sri V.K. Dongre Sasti of Hyderabad for having given me his unstinted guidance and help in elucidating many points in the course of my re-editing the work. This is the first time a full English translation of the Dipika appears in English. 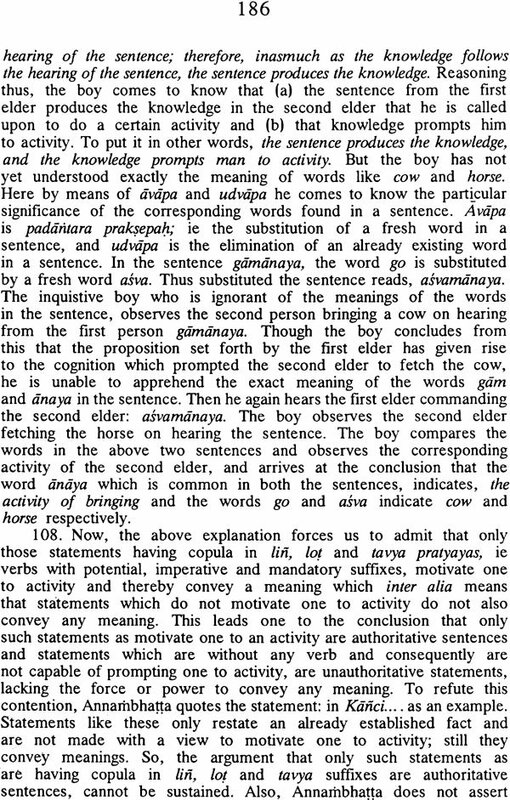 Even as it was being serialized in the Vedanta Kesari with annotations, it was found much useful to the students reading for M.A. Sanskrit in the Madras University. Many teachers and students of Sanskrit, particularly of Nyaya-Vaisesika Philosophy, pressed me hard to bring out the translation in a book form to make it available to the teacher-student community. The result is the present edition. To facilitate the study of the Text even by those who do not know Sanskrit, a word for word transliteration of the text with meaning is given. My grateful thanks are due to Mr. Ramakrishna of Ravanasamudram who has very kindly gone through the entire revised manuscript before it was sent to the Press. 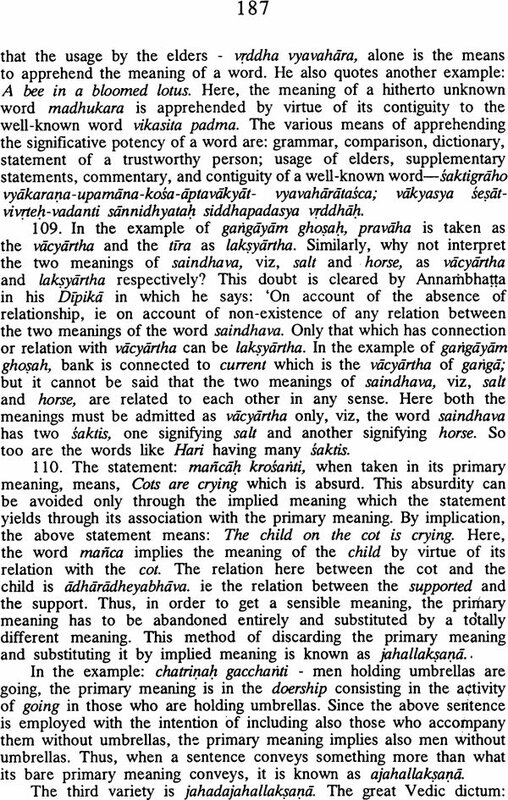 The Tarka-samgraha of Annambhatta is the most popular introductory work on the Nyaya-Vaisesika system of Indian Philosophy. There are a few English expositions of this work, the most notable being A Primer of Indian Logic by Prof. Kuppuswami Sastri. Sri Athalye's annotated edition of the English translation of the Text by Sri Bodas is also well-known. Both these works have been consulted and made use of by the present translator in preparing this translation. A French exposition of the same Text by A. Foucher, Le Compendium des Topiques-Tarkasamgraha also shows the importance of the work. With its expository gloss, called the Dipika is a introductory treatise by Annambhatta to the study of Nyaya-Vaisesika. A native of Andhra, Annambhatta is said to have flourished in C. 1600. He was the son of Meligiri Tirumalaraya, younger brother of Sarvadeva, and pupil of Brahmendra Saravati in Advaita, of Viresvara of Varanasi in Vyakarana, and Viswanatha in Mimamsa. He was a scholar in Nyaya, Mimamsa, Vyakarana and Advaita and has written a number of learned commentaries on them. The better known among them are his commentaries on Bhatta Somesvara's Nyaya Sudha on Panini's Astadhyayi on Badarayana's Brahma Sutras, on Kaiyyata's Pradipa and on Jayadeva's Manyaloka. But his Tarka-Samgraha with his expository gloss on it, called the Dipika is the most popular introductory handbook on Indian Logic, the study of which is considered indispensable to the students of the Nyaya and Vaisesika systems of Philosophy. 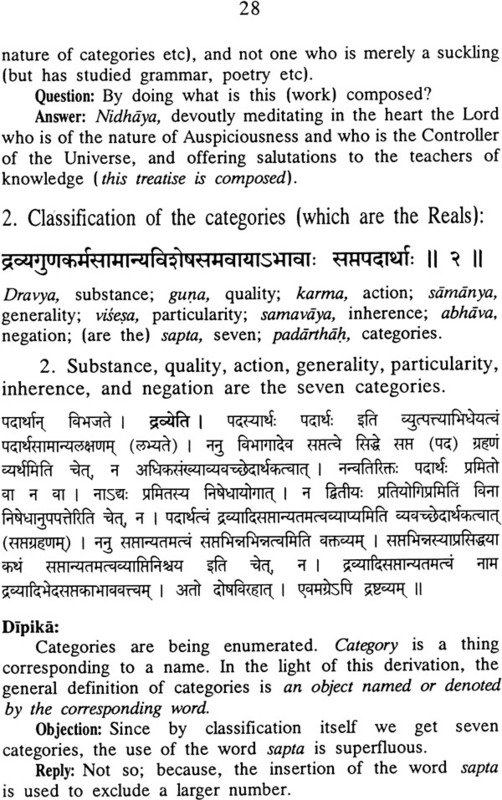 Tarka-Samgraha with its Dipika contains the essence of both the Nyaya and Vaisesika schools of Thought. 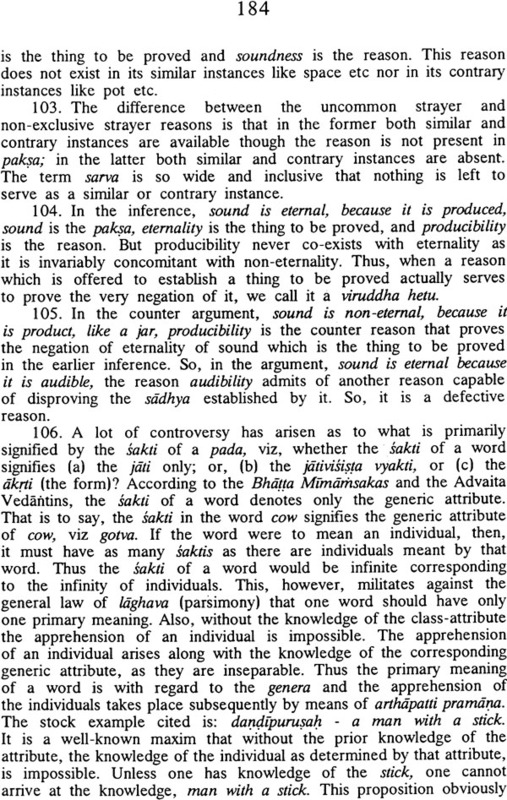 Hence, the term Tarka-samgraha does not mean merely logic as it is generally understood to be. 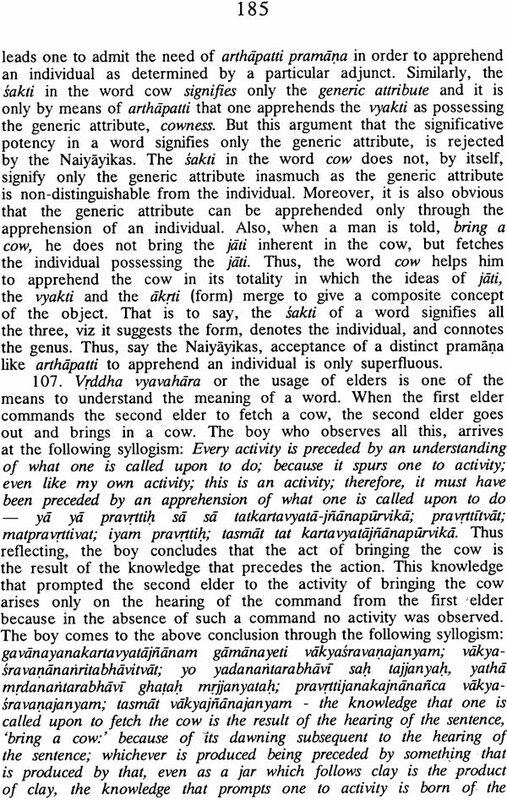 As Annambhatta himself explains it in his Dipika, it is a compendious elucidation of the nature of substances, qualities and such other ontological categories of the Vaisesika system of Philosophy accepted by the Nyaya school of Thought. The translator will consider his labour amply rewarded if this work proves to be of some help to the students of Nyaya-Vaisesika Philosophy and to the lovers of Sanskrit and Indian Philosophy in general.